I’d try BonaX and proceed cautiously. I’m with Slim. Murphey Oil Soap is a great product. I’ve also had luck with just plain old mineral spirits. Again, Murphy’s Oil Soap. 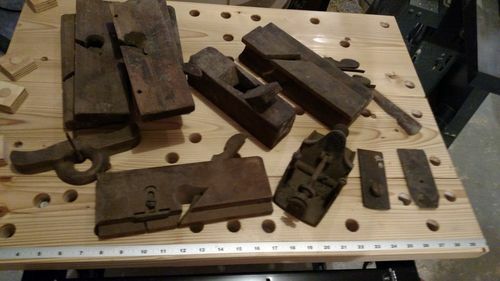 Our town’s historical society had a tool chest hidden in the mess in the basement. We discovered about 60 wood-body planes in the chest. We used Murphy’s with great results. Good book on the topic. Some would say not to use a water based product like Murphy’s but I’ve had good luck with it on the old wooden items I’ve cleaned. I suppose the only thing to worry about would be a rare collectible plane such as 18th century or earlier or a famous maker, etc. Worth checking the makers marks quickly before proceeding. Try to get clear pictures of one of those or tell us what the marks say. Do you have that book Wayne? I’ve been considering it. I do. It’s an excellent book. Some would say not to use a water based product like Murphy s but I ve had good luck with it on the old wooden items I ve cleaned. I suppose the only thing to worry about would be a rare collectible plane such as 18th century or earlier or a famous maker, etc. Worth checking the makers marks quickly before proceeding. Try to get clear pictures of one of those or tell us what the marks say. Good point thanks – I’ll check first but I think these aren’t that old. 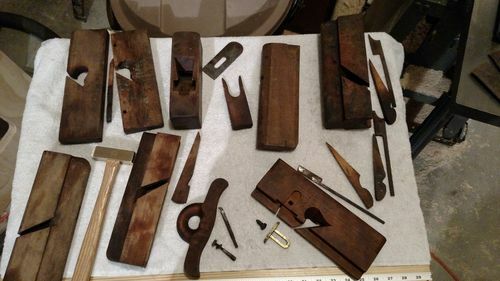 They were my dad’s back when he was a Journeyman cabinetmaker in the late 30’s up until the war. Not my formula, wish I could remember whose. Believe it came from a furniture restorer. 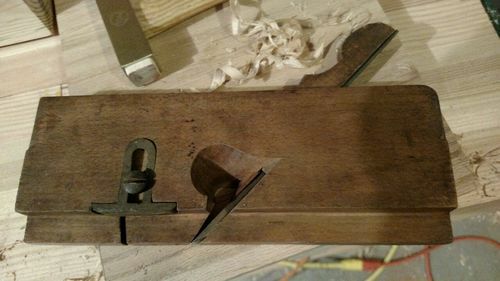 Used on all my wood planes, smells good, too. Finish with Minwax Antique Oil Finish – planes feel incredible. Water based cleaning is fine, just oil the items after cleaning to prevent rust and prevent the wood from drying out. I use equal parts of blo, vinegar, and mineral spirits. Cleaned with Murphy’s I see why people use it. Dirt is gone but the patina is still there. Now that I have the basic dirt off them I’ll give this a try. I even have all the components laying around. denatured alcohol and steel wool works well. Hey, you still have that scraper? -- MFia-made man. But that doesn't mean I don't dig my 45. Minneapolis/St. Paul, burbs.